Still think children's cartoons are innocent, harmless entertainment? Think again. In the summer of 2018, there are not one but two new animated series that openly promote the drag queen lifestyle to children. Both aimed at young children, they represent another tactic of gender radicals who are increasingly focusing their propaganda efforts on the youngest, most vulnerable members of society. 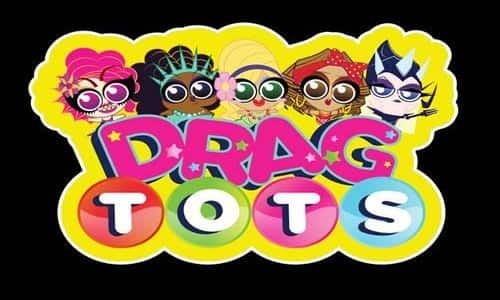 The animated series "Drag Tots!" features simplistically drawn toddlers who are, somehow, already living as drag queens as they explore facets of the drag queen lifestyle. They do this with the help of a cartoon unicorn voiced by transgender celebrity RuPaul. The series is set to air on June 28th, but early reports mention an episode focused on a visit to a wig factory and another to an 'alternate drag universe' in which men dress like women. These "drag queen themed adventures" are placed in an educational context for the viewers along the lines of The Magic School Bus children's book and cartoon series with the tagline, "School has never been so fierce!" as an obvious attempt to indoctrinate children to believe that the drag queen life style is both common and normal. The show features several prominent drag queens as the voices of the characters and the trailer ends with a chorus of children merrily singing the new jingle, "Drag, drag, drag, drag, drag tots! Yeah!" that just rolls off the tongue. A generation ago, educational cartoons taught children about science, history and geography but now these academic subjects are being pushed out by gender-radical propaganda intended to program susceptible young minds to embrace postmodern concepts of gender fluidity. Talk about child abuse! The second animated series, "Super Drags" was previewed with the first promotional trailers on May 31st and is set to debut on Netflix sometime in the next few months. The show has a look and theme similar to the popular Power Puff Girls but with the one caveat, that the young cartoon super heroes are all drag queens. The tagline of this show reads, "By night, they tighten up their corsets and transform into the baddest super drags in town, ready to combat shade and rescue the world's glitter from the evil villains. Get ready, because the Super Drags are going deeper than you think." We will leave to the discerning reader to decipher any possible double entendre to be found in the fact that these super drag heroes are "going deeper than you think." Several conservative voices have already voiced their criticism of these cartoons as "woke pederasty" because they essentially hijack the gender fluid and gender questioning movements not to advocate for more rights or freedom from discrimination, but instead to push a dangerous agenda that promotes abnormal sexual behaviors in and toward children. Why have we come to believe that it is not only acceptable but a sign of progress, Rod Dreher of The American Conservative asks, that we dress little boys up like sexually provocative women? From transgender reading sessions at the local library and pre-teen drag shows to cartoons and elementary school transgender promotional curricula, we all live in a world in which popular culture thinks that abnormal is normal. Now is the time to make your voice heard, before the next generation has been indoctrinated with this moral aberration; that it should be so ingrained in their thinking as to be beyond question. Now is the time to write to the networks, cancel your subscriptions and speak out against this new form of "education".